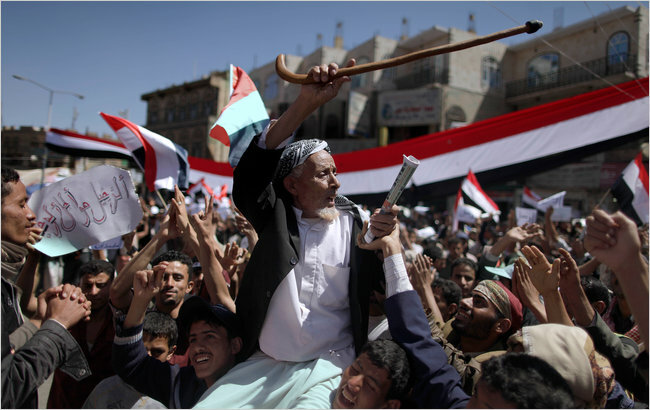 In Yemen today, thousands continued to demonstrate throughout the country, one day after opposition groups rejected President Ali Abdullah Saleh’s offer to form a unity government. 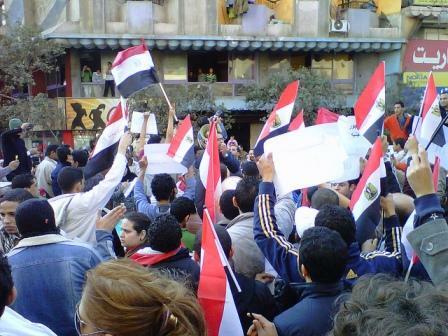 Demonstrators and opposition groups are calling for an immediate end to Saleh’s three-decade rule. Tens of thousands filling Yemen’s capital, Sana’a, chanted “the people want the downfall of the regime.” Other cities, including Ibb and Taiz, also reported demonstrators numbering in the tens of thousands. Saleh lashed out at the United States today, accusing it of instigating protests and coordinating with opposition groups and complained of Washington’s pressure on Arab leaders to respond to protesters with restraint. A rally that brought over 100,000 demonstrators to Egypt’s Tahrir Square was dispersed this morning by Egyptian soldiers firing in the air and using batons and tasers against demonstrators who were demanding that the Hosni Mubarak cabinet be purged by the country’s new military leaders. Egyptians had gathered in Tahrir Square to celebrate the two week mark since Mubarak’s removal and to remind the military rulers now in charge of its commitments to the people at the time of Mubarak’s ouster. 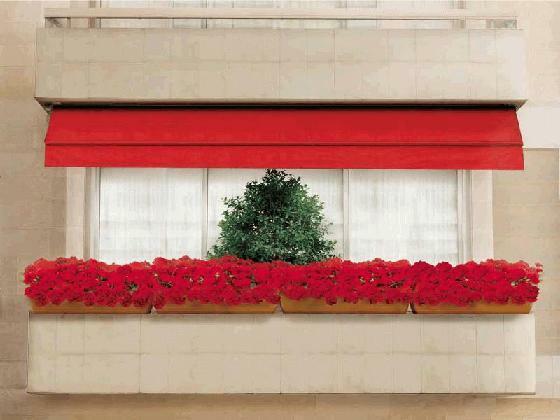 One of the commitments was to install a team of technocrats to replace the Mubarak-appointed cabinet. Activists are using the demonstrations to guard against “counter-revolution” of the people’s power. But after midnight, demonstrators said the military fired in the air, shut off the light from lamp posts, and moved in on protesters to force them to leave the square, in an unusual use of military force against protesters since Mubarak’s fall. In Bahrain today, up to 80 demonstrators in Manama’s Pearl Square were injured as police fired rubber bullets and tear gas earlier today. Thousands of protesters singing and dancing protesters streamed back into the Square today, after tanks, troops and then riot police withdrew from the traffic circle. Bobby Ghosh, the author of the below analysis, which focuses on the connections of the younger generation that has just toppled two tyrants, just gave an excellent interview on the Charlie Rose show. One important point he made on the show that is not included in the article is the military’s role in each of the countries experiencing protests. In Egypt, the Army has traditionally seen its role as the protector of the country. In other states, however, the military’s role is the protection of the regime. Although Hizbollah and Iran hailed the ouster of the Egyptian president Hosni Mubarak as a political defeat for their enemies, it is not at all certain that Sunnis in some parts of the Arab world, particularly in Lebanon, were distressed by the transformations in Cairo. Iran’s satisfaction, and that of its Arab followers, derived from a short-term appraisal that Mr Mubarak’s departure was a setback for the United States. 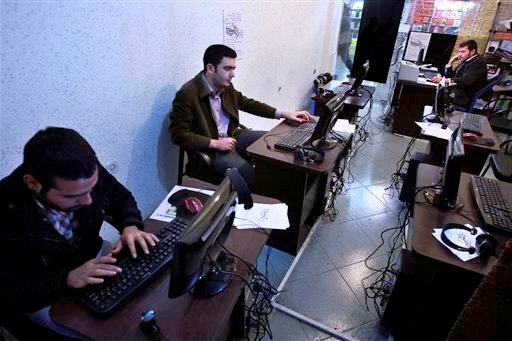 However, nothing yet indicates that Washington has “lost” Egypt. In fact, America’s regional role may be strengthened if its Arab friends become more democratic, or just more pluralistic. 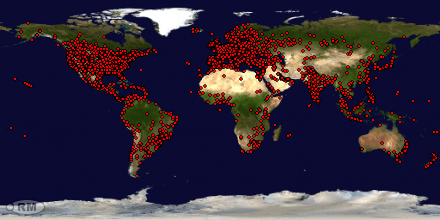 After all, the protests in Tunisia and Egypt confirmed the deep detestation for – and therefore the fragility of – an American-led network of regional alliances resting on a foundation of despotism. 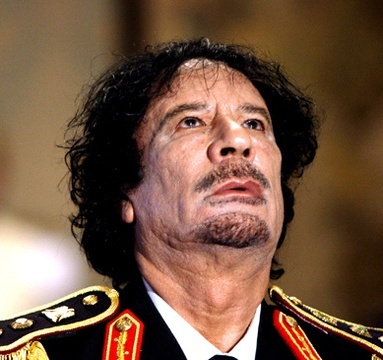 Social unrest has come to Libya after street revolts in its neighbors Tunisia and Egypt. The wealthiest North African country had began to dig deeper into its pockets to address social grievances, but rioting broke out in the city of Benghazi in mid-February. Despite its vast oil and gas wealth and a relatively small population of 6.5 million, Libya has both the highest demographic growth and unemployment rates in North Africa. 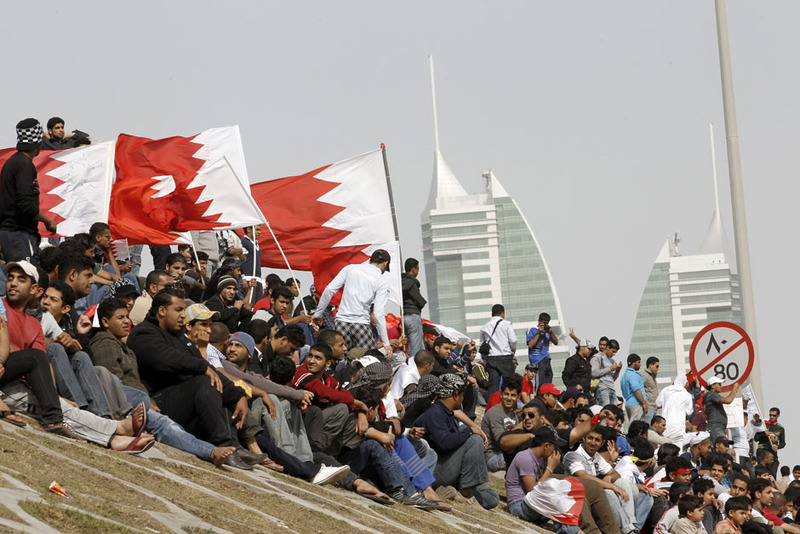 Thousands of people are occupying the center of the Bahraini capital on a third day of anti-government protests. The numbers of those who had camped out overnight in Manama’s Pearl Square were swelled by many who joined the protests throughout the day. Former US National Security Advisor Zbigniew Brzezinski’s comments on the Egyptian Revolution and the US response, as well as the spreading unrest throughout the region. Thousands of protesters poured into a main square in Bahrain’s capital Tuesday in an Egypt-style rebellion that sharply escalated pressure on authorities as the Arab push for change gripped the Gulf for the first time. 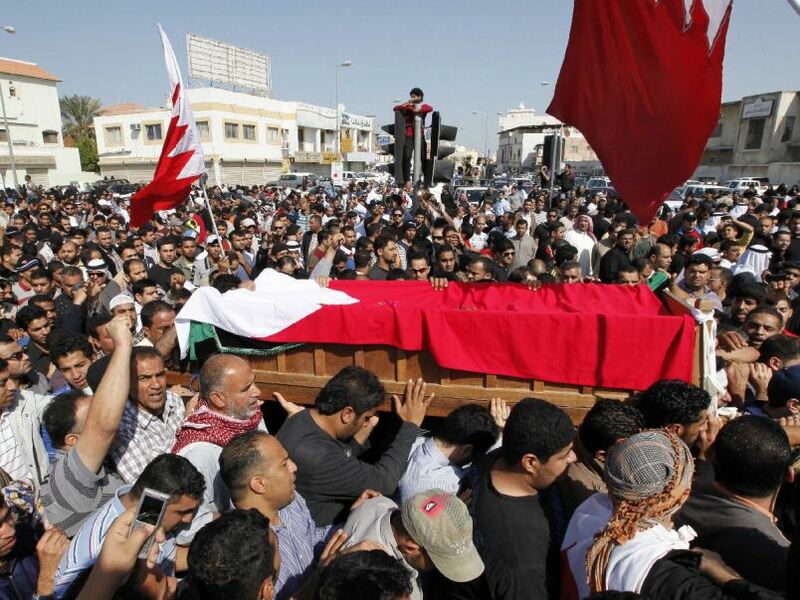 The killing on a second protester today spurred the largest Shiite bloc to suspend its participation in Parliament. Security forces have battled demonstrators calling for political reforms and greater freedoms over two days, leading to the deaths of two protesters and the main opposition group vowing to freeze its work in parliament in protest. In a clear sign of concern over the widening crisis, Bahrain’s King Hamad bin Isa Al Khalifa made a rare national TV address, offering condolences for the deaths, pledging an investigation into the killings and promising to push ahead with reforms, which include loosening state controls on the media and Internet. Below is a video clip of Bahraini security forces repeatedly firing rubber bullets at a crowd of demonstrators as it retreats. 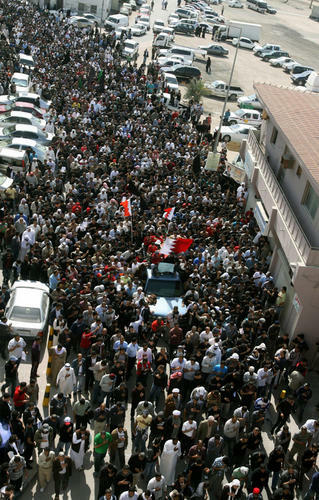 The full report about today’s protest in Bahrain can be found here. The video below includes portions secretly filmed at today’s protests in Yemen. Ed. Note: Apparently, Ayatollah Ali Khamenei and Mahmoud Ahmadinejad think it’s fine for Egyptians to voice complaints but, as we saw after the contested election in 2009, when Iranians start to protest, they’re beaten like Persian rugs. At least one person was killed and several others wounded during clashes with security forces firing rubber bullets, tear gas, and beating demonstrators with batons. Dozens were detained as they rallied in support of uprisings in Egypt and Tunisia. 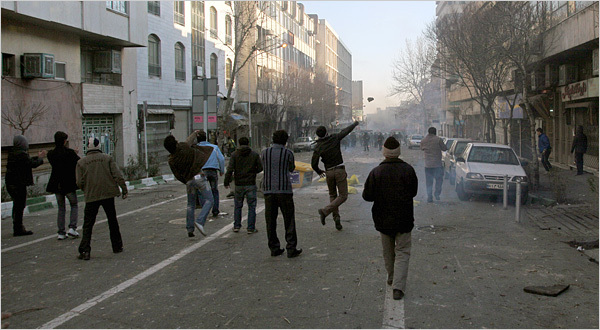 The fiercest clashes were reported close to Azadi Square in the capital, and ambulances were seen coming and going. Witnesses told the Associated Press that at least three protesters were wounded by bullets, with dozens of others beaten by the security forces and taken to hospital. 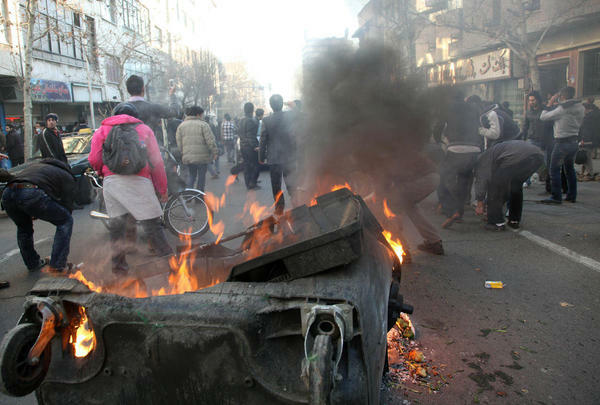 The BBC reports sources saying similar protests are being held in the cities of Isfahan, Mashhad and Shiraz. Ed. Note: This dispatch is updated with more recent information, photos and videos here, here, here, here and here. Reuters is reporting that police are firing teargas and rubber bullets to break up demonstrations in Bahrain today, and at least one protester killed according to witnesses in a “Day of Rage” stimulated by popular upheaval in Egypt and Tunisia. 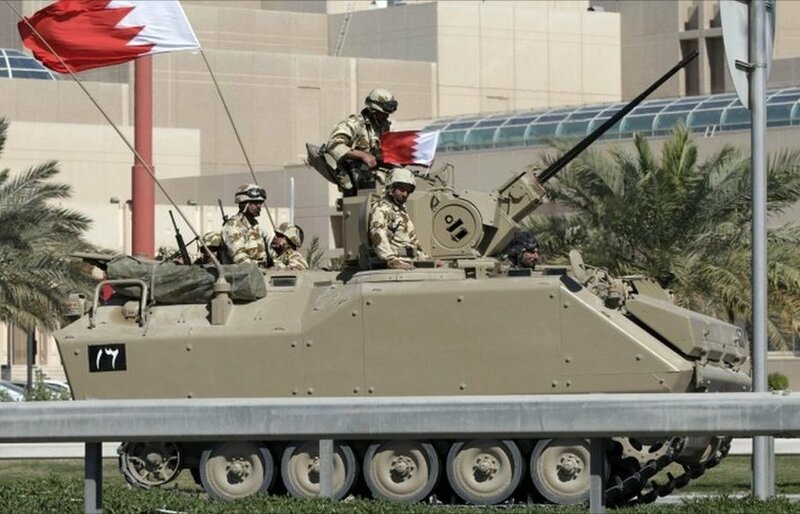 Helicopters circled over the Gulf Arab state’s capital Manama, where protesters had been due to gather but which remained quiet as security forces patrolled Shi’ite areas. 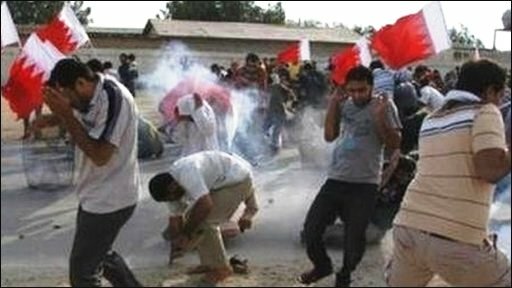 More than 20 people were hurt, one of them critically, in clashes in Shi’ite villages that ring the capital, witnesses said. The New York Times reports that 20 Bahraini police officers raised their weapons and fired rubber bullets and canisters of tear gas directly into a small group of protesters chanting slogans and holding signs. One man fell instantly and was shot at as he squirmed on the ground. Another was trapped against a wall and writhed as an officer shot rubber bullets at him, again. The 19-year-old state of emergency in Algeria will end within days, Foreign Minister Mourad Medelci said on Monday following a weekend in which thousands of Algerians defied government warnings and dodged barricades to rally in their capital Saturday, demanding democratic reforms. 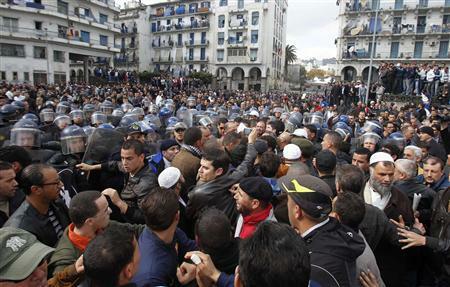 Protesters chanting “No to the police state!” and brandishing signs that read “Give us back our Algeria” clashed with baton-wielding police in helmets and visors. Organizers said more than 400 people were briefly detained, but aside from some jostling between police and protesters no violence was reported. A state of emergency has been in force in Algeria since 1992 and the government has come under pressure to ditch emergency laws following uprisings in Egypt and Tunisia.